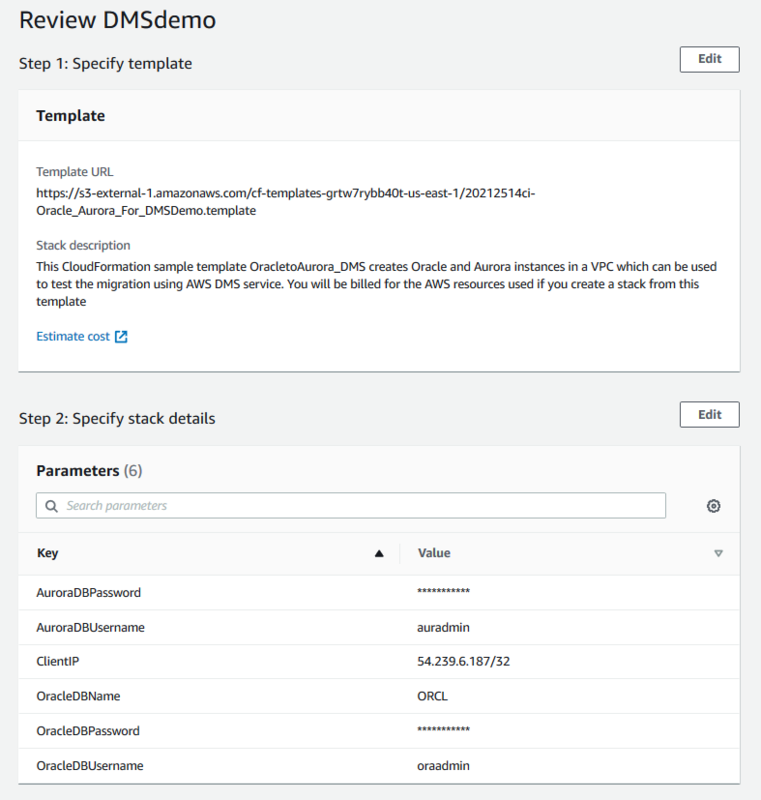 Extract the CloudFormation template (Oracle_Aurora_For_DMSDemo.template) from the archive. 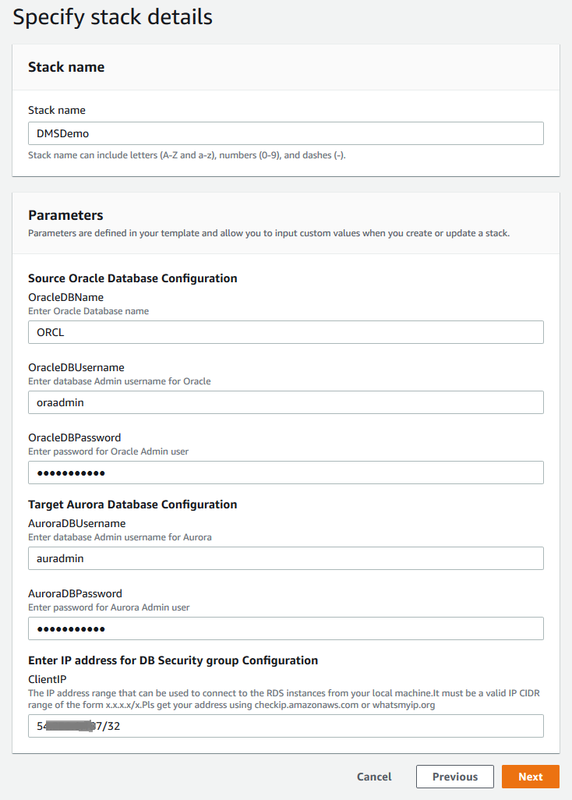 Copy and paste the Oracle_Aurora_For_DMSDemo.template file into your current directory. 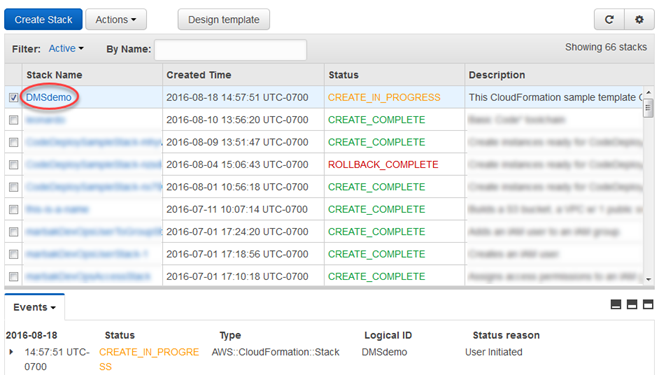 Now you need to provision the necessary AWS resources for this walkthrough. Click Choose File, and then choose the Oracle_Aurora_For_DMSDemo.template file that you extracted from the dms-sbs-RDSOracle2Aurora.zip archive. Choose Next. On the Specify Details page, provide parameter values as shown following. Provide a unique name for your database. The name should begin with a letter. The default is ORCL. Specify the admin (DBA) user for managing the Oracle instance. The default is oraadmin. Provide the password for the admin user. The default is oraadmin123 . Specify the admin (DBA) user for managing the Aurora MySQL instance. The default is auradmin . Provide the password for the admin user. The default is auradmin123 . Specify the IP address in CIDR (x.x.x.x/32) format for your local computer. You can get your IP address from whatsmyip.org. Your RDS instances' security group will allow ingress to this IP address. The default is access from anywhere (0.0.0.0/0), which is not recommended; you should use your IP address for this walkthrough. Choose Next. On the Options page, shown following, choose Next. 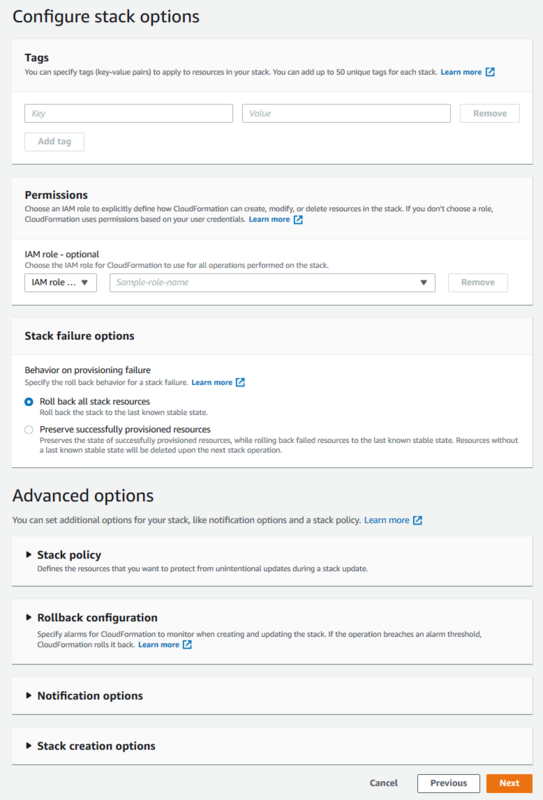 On the Review page, review the details, and if they are correct choose Create Stack. You can get the estimated cost of running this CloudFormation template by choosing Cost. AWS can take about 20 minutes or more to create the stack with Amazon RDS Oracle and Amazon Aurora MySQL instances. 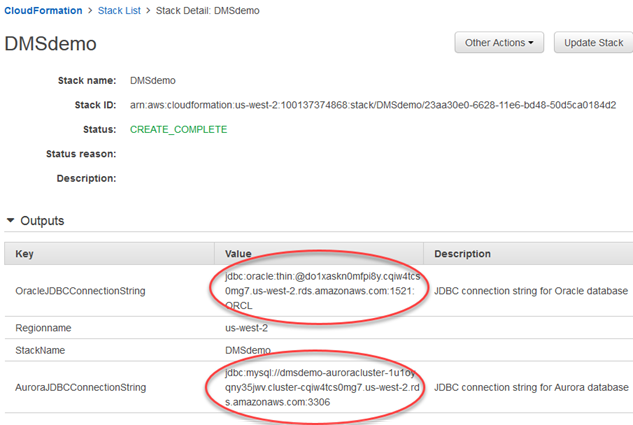 After the stack is created, choose Stack, select the DMSdemo stack, and then choose Outputs. Record the JDBC connection strings, OracleJDBCConnectionString and AuroraJDBCConnectionString, for use later in this walkthrough to connect to the Oracle and Aurora MySQL DB instances. Oracle 12c SE Two License version 12.1.0.2.v4 is available in all regions. However, Amazon Aurora MySQL is not available in all regions. Amazon Aurora MySQL is currently available in US East (N. Virginia), US West (Oregon), EU (Ireland), Asia Pacific (Tokyo), Asia Pacific (Mumbai), Asia Pacific (Sydney), and Asia Pacific (Seoul). If you try to create a stack in a region where Aurora MySQL is not available, creation fails with the error Invalid DB Engine for AuroraCluster.